Football legend Harry Redknapp has launched an online business to bring his beloved jam roly polys to the nation. He now talks about it in the latest GoDaddy UK advert, highlighting that the company gives you “all the help and tools you need to succeed online”. Redknapp, who’s been recently crowned King of the Jungle, stars in a 30-second spot, talking about how he came up with his business idea and how GoDaddy helped him grow his business. “When I was in the jungle, the fault of one thing kept me going: jam roly polys. I love them so much I even started my own business,” he says from the wheel of his truck featuring the name of his business – Harry’s Roly Polys – and the website. “These days you got to be online, so I went to GoDaddy, registered the name, built a website… Dead easy. Even a 24/7 support on the blower. It’s gone so well I got my baking game to keep up with the demand,” he also says, showing then how he is “a real pro” at making them. 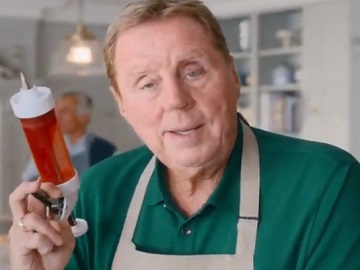 Harrysrolypolys.uk, launched after Redknapp seized the opportunity to bring his wife Sandra’s secret recipe to market, is the place where consumers can buy online Harry’s own-brand roly polys. Profits will go to homelessness charity Hope Housing. GoDaddy encourages people to start their Website Builder free trial, on any device, built their website and promote it with built-in marketing tools, highlighting that a smart, friendly customer care team is more than happy to help, 24/7. The company also provides tips and advice for small business owners, such as info about how much it costs to get your business online, tips on how to choose a memorable business name, and more. Redknapp also stars in a new campaign for BetVictor, one of Europe’s leading online gambling companies. Appointed on March 8 as a Brand Ambassador for BetVictor on a two-year contract, he appears as the face of BetVictor’s new chatbot feature.